In this simple yet complete guide, the authors walk through many of the critical social media policy issues with which organizations struggle: the reasons for a policy, applying organizational values to the policy, social media roles, what to say online, social media monitoring strategy, responding to criticism online, responding to other comments online, privacy and permissions, and thinking through copyright and attributions. Each section offers at least one highlighted example from an organization that has struggled with the same issue, and how the issue was resolved. When I was an online community manager, I was left to navigate the online community without guidance. I found myself making judgment calls on the fly about how much about myself to reveal personally when interacting within other online communities, how to deal with negative criticism, staying on message when developing personal relationships with community members, and whether or not to use my personal social media accounts to promote organizational efforts. The Social Media Policy Workbook is a godsend for organizations grappling with just these issues. It is non-judgmental and approachable. There are no set rules or strictures; policy positions are laid out along a continuum of choices that best fit an organization’s values, mission and culture. It is hands on. It’s really a workbook, and every section of the workbook includes probing questions, guided exercises and space for answers. Real-world stories and experiences from organizational staff support each section of the workbook. The companion social media template is terrific. The online template is not a duplicate of the workbook; it’s a companion piece of sample language taken from existing social media policies of other organizations. It is short, sweet and to the point. At 20 pages, it’s just the perfect length not to intimidate. For every decision, there are guided questions, simple worksheets and space to add organization-specific data. For example, it includes a stellar worksheet intended to help leadership consider social media roles and responsibilities within the organization. The workbook could benefit from a section about how personal you want your organization to act or appear online. I struggled with this same issue as an online manager: Do I sign the organization’s Twitter updates with my initials? Should I add my name to any/some/all of the Facebook posts? Should I put my name at the top of our Foursquare account? It would be helpful to include in the workbook a list of the social media channels, and ask which circumstances in which it is more or less appropriate to connect as a person rather than “a logo” online. Chapter two, “Your Organization’s Social Media Values,” could easily be modified to include this discussion. I also wish that the workbook had included a discussion or decision-tree around posting within other professional spaces (LinkedIn groups, other Facebook Pages) as a staff person. How and when to identify the fact that you also work at a certain organization is an issue all staff encounter at times. 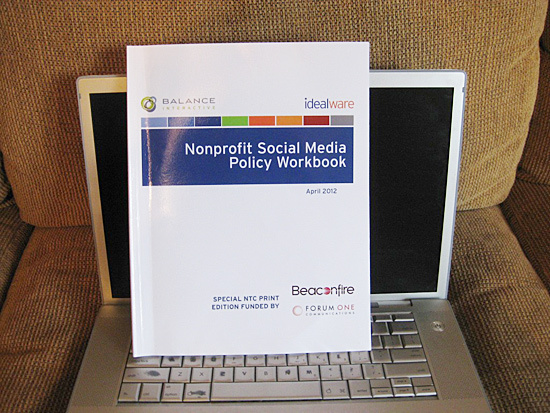 The Nonprofit Social Media Policy Workbook is an essential resource for initiating, discussing and drafting your organization’s social media policies. Download it here. If you are looking for a starting point for your social media policy, look no further.Debra Askanase works with nonprofits and businesses to create engagement strategies that move people to action. She is a social media strategist and partner in Socialbrite. Visit her profile page, see her Community Organizer 2.0 blog, follow her on Twitter, contact Debra by email or leave a comment. Check your social profile at http://www.Social-Fingerprint.com. Its free.